If you aren’t a tea drinker, we know what you’re thinking: a sweater for a teapot? Well. Brewing a cup at a time is a perfectly suitable practice, of course, but there are two specific instances in which we think a full pot is the preferable portion size. The first is when providing for a crowd; what’s a better icebreaker around the breakfast table (or while plating up that pumpkin pie!) than sharing a cuppa with family? (And when Aunt Rosie asks about your plus-one that never showed, just gaze into your cup and pretend you’ve taken up reading tea leaves.) The second is for those days–you know the ones!–when you’ve got a house to yourself, a stack of DVDs lined up, a new project at the ready and an entire day in front of you that’s meant for nothing but a marathon knitting session. Constantly getting up to brew another cup would pull you away from House of Cards for longer than necessary–why not just keep an entire pot at arm’s length? Left alone in a ceramic pot, tea is bound to cool down, but wrapping the it in a layer of wool keeps things much warmer than you’d think. 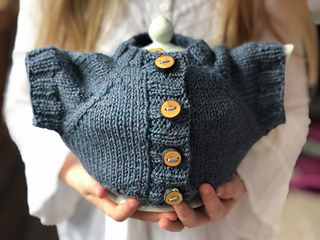 This tea cozy is knit in the same way a full-sized, top-down sweater is–except it’s quicker, kitschier and will certainly be a conversation starter. The pattern is written for one size, which will fit an average 6-8 cup pot. And yes, it’s named after the lovable character from ‘Beauty and the Beast’.